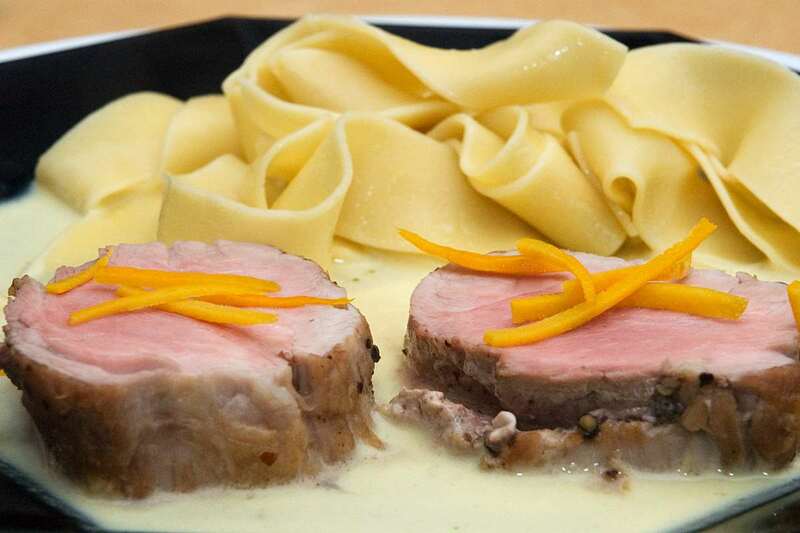 An almost-classic that is easy to prepare: Pork tenderloin in a flavorful orange sauce with a bit of saffron added. The sauce gets is flavor from orange peel and orange juice. The pork fillet slices and the sauce go best with pasta, but you can also serve them with rice. Trim pork tenderloin. Fold over thin end so that the meat is of equal thickness along its length. Attach with twine or skewers. Season the meat with black pepper. Set heavy pan over medium to high heat. Add vegetable oil. Cook tenderloin from all sides until well browned. Remove from pan, set aside. Reduce heat. Add chopped onion, cook until soft and translucent. In the meanwhile use a vegetable peeler to cut off very thin slices of orange peel (only the thin orange-colored layer, avoid the white pith). Add orange peel and garlic to the pan. Cook for 1-2 minutes, do not brown the garlic. Add white wine and salt. Return tenderloin to the pan and cover partially. Cook meat over medium heat until it has almost reached the desired degree of doneness (ca. 10-20 minutes). I cook the meat so that it is still very slightly pink in the center. Remove from pan, wrap in aluminum foil and keep warm (e.g. wrap in a blanket) while preparing the sauce. Remove orange peel slices from pan and cut into fine strips to use as garnish. Squeeze the orange and add the juice. Add the triple sec and saffron. Reduce until only a small amount of liquid is left. Reduce heat, stir in sour cream. Adjust seasoning with salt and pepper. Preparation time ca. 45 minutes. My recipe is based on my Mom's recipe for pork fillets in orange sauce, with the orange peel and the saffron added for flavor. couldn't hunt down the saffron... regardless, an easy and satisfying meal. i say go for it. This was pretty excellent. I thought the amount of onion was perfect, and the saffron was a nice touch. We must have totally different stoves, though, because the pork took at least 20 minutes on medium-high to reach 140 F. I had to add extra white wine to keep the onion, garlic, and orange peel from drying out and burning. Sauce was a bit too acidic, next time I'll maybe use heavy cream and cook it down rather than using sour cream.